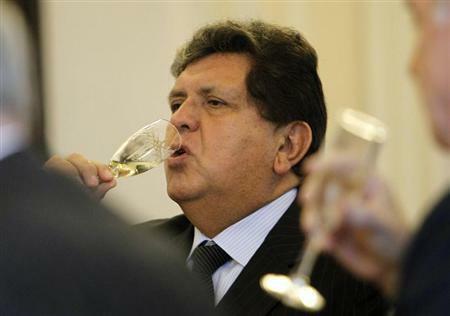 Lima -- (Reuters) - Peru's attorney general is opening the financial records of two-time former president and likely 2016 presidential candidate Alan Garcia as part of a preliminary corruption inquiry, the government said on Friday. The government suspects Garcia may have used illegally acquired funds to buy a house in an upscale Lima neighborhood, a spokeswoman in the attorney general's office told Reuters. The decision to lift bank secrecy protections for Garcia comes during a separate investigation in Congress into an alleged pay-for-pardons scheme that freed thousands of convicted drug traffickers from prison during Garcia's 2006-2011 administration. The two inquiries could shake up the presidential race in 2016, since a judicial trial or congressional vote to disqualify Garcia could stop his expected bid for a third term. Garcia has denied any wrongdoing and says he is being persecuted politically. Garcia, who first became president in 1985 at age 36, tweeted on Friday that had no problem with the government verifying his reported income. He told Peruvian television that he earned money from speaking at conferences, writing books and directing a university program. "That's how I had more than enough money to buy that house," Garcia added. He has said that President Ollanta Humala and first lady Nadine Heredia are behind the investigations because they want to ensure "the re-election of the presidential couple." Despite her denials, Heredia is widely expected to seek the presidency in 2016. Her husband cannot run for re-election because of a constitutional ban on consecutive terms. Heredia is also being investigated - by Peru's budget auditor - at the request of opposition lawmakers who say she has used public funds to promote herself. The Humala administration says those accusations are unfounded. Garcia has not officially launched a campaign for the presidency, but said last month he would run "if it were necessary for the country." "I could not refuse," Garcia said in an interview on CNN Chile. "I've given my life to Peru."